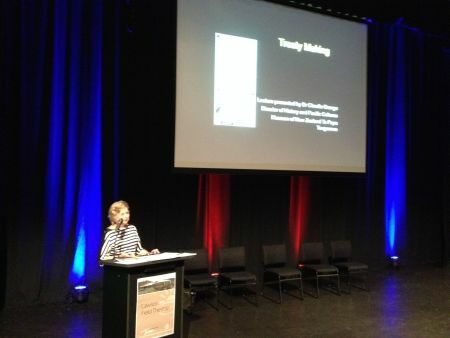 Recently Dame Claudia Orange, supported by the Ministry of Culture and Heritage and National Services Te Paerangi, delivered a series of talks commemorating the 175th anniversary of the signing of the Treaty of Waitangi. In Gisborne, Claudia spoke to over 160 guests in the Lawson Field Theatre. This well-received presentation rounded off a wonderful series of public talks that were held in locations of historical significance around Aotearoa, including Akaroa, Marlborough, Otaki, and Gisborne. Huge thanks to Claudia, who kindly found the time to squeeze in this series of presentations while also working at Te Papa, working on her Treaty research, and contributing greatly towards the Waitangi National Trust’s new museum and education centre that opened earlier this year. 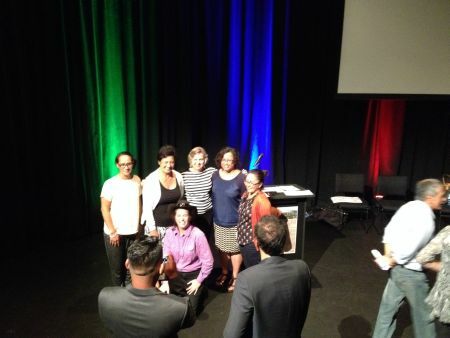 I would also like to acknowledge National Services Te Paerangi’s Iwi Development Manager, Kylie Ngaropo, for co-ordinating these events, and last but not least, all those wonderful people who supported in our communities and museums. 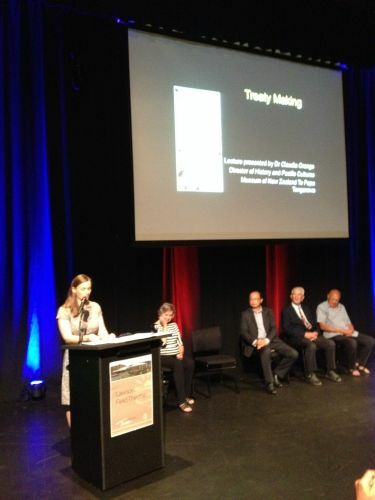 These talks have provided a wonderful opportunity for our communities, iwi Māori, and museums, to raise awareness of the many interesting aspects associated with our history and the ongoing power and relevance of the Treaty of Waitangi. Turanga locals posing for a whanau photo with Dame Claudia Orange. The event in Gisborne was kindly supported by the Tairawhiti Museum board and staff, the Ministry of Culture and Heritage and National Services Te Paerangi. The public talk in Gisborne ran over time as you would expect! There were many interested locals who wanted to ask questions and speak with Claudia one-on-one about her life’s work and ongoing research. Claudia spent the evening talking about Aotearoa history leading up to the signing of the Treaty of Waitangi in 1840. She guided us through how the Treaty documents were circulated around the country for Māori to sign, and how missionaries, traders or officials explained the terms of the Treaty at 50 or so signing meetings between February and September 1840 – from the far north of the North Island to Ruapuke Island in Foveaux Strait. One of the many aspects that were of interest in Turanga was seeing and tracking the huge loss of lands for Māori following the signing of the Treaty. It was great to have the opportunity for dialogue about the Treaty with an expert in our community, to hear Claudia speak about the historical accounts, including related passages from archived diaries and official documents, and to discuss these losses and others in reference to the Articles of the Treaty. For those that might have missed these talks and would like to read more, I’d suggest looking up the NZHistory website. A lot of Claudia’s research can be found here. On 5 May, Maggie Barry, the Minister of Arts, Culture and Heritage, announced the launch of the Regional Culture and Heritage Fund (RCHF), replacing the Regional Museums Policy Fund. The RCHF will be funded at the same level, but the criteria have been broadened to also include performing arts venues such as theatres and opera houses, heritage buildings that display collections and whare taonga. What hasn’t changed is that this funding remains a fund of last resort. Applicants will have to show they have secured funding from other avenues, such as local government and philanthropic contributions, on the ‘a third, a third, a third’ basis. If your organisation is looking to apply for this fund I’d highly recommend making contact with the Ministry for Culture and Heritage staff and discussing your project in detail. Contact them on 04 496 6175 or rchf@mch.govt.nz.